Mug cakes are perfect when you're a home and craving for some cake. 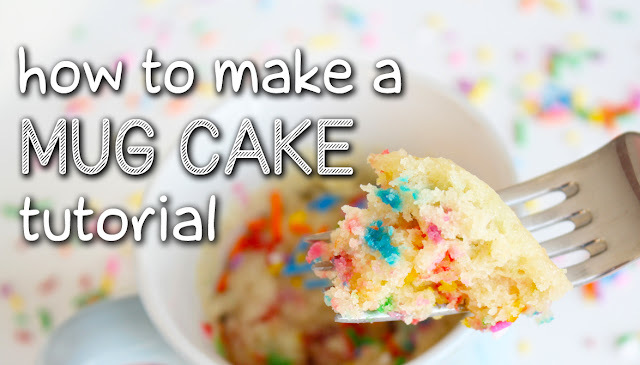 Instead of baking an entire cake, which can take up to a couple of hours, a mug cake takes less than 5 minutes, and you can make single serving too! make each recipe. 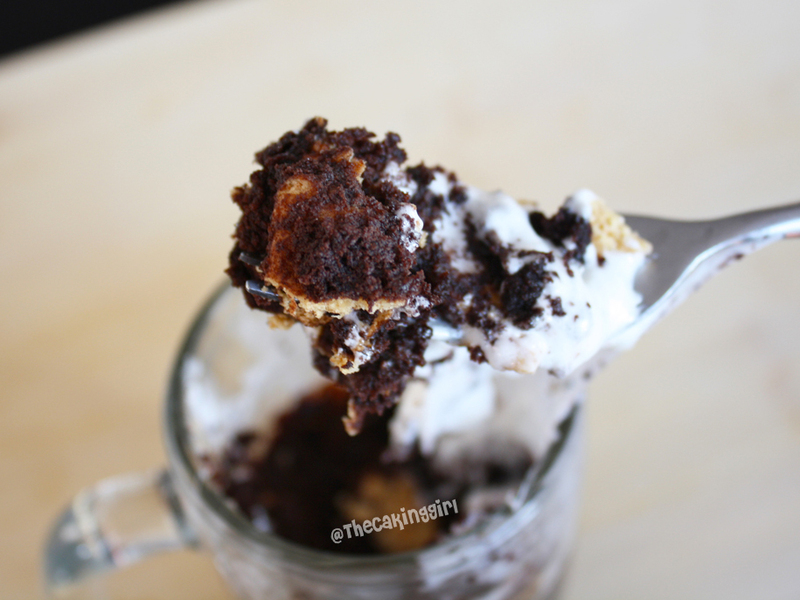 There's 4 recipes in the tutorial... there's Chocolate Brownie, Confetti, S'More and Cheesecake. 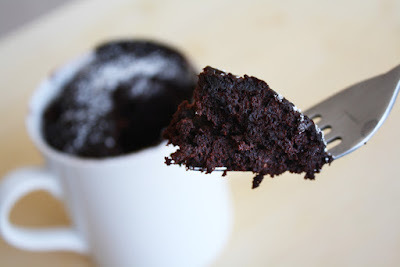 Most recipes call for 1 min on high in the microwave, if the cake is still not baked yet, put it back on high in the microwave at 15 seconds burst until the top of the cake is dry. Instructions: Mix the dry ingredients together in a mug. Add egg, milk, oil and vanilla extract. 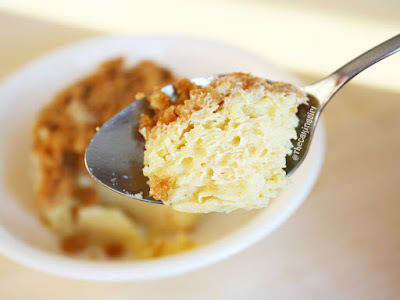 Stir until the batter is smooth and microwave on high for 1 minute. 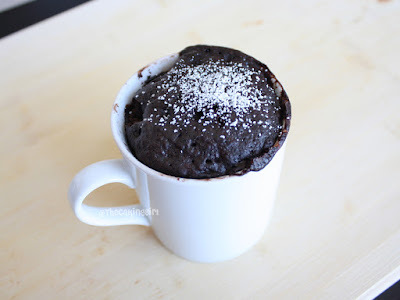 Instructions: Misx the flour, sugar and cocoa powder in a mug. Add the egg, food coloring, oil and buttermilk. Stir until the batter is smooth. Microwave on high for 1 1/2 mins. Instructions: Beat the cream cheese and butter with electric mixer until fluffy. Add vanilla and powdered sugar and beat until smooth. Instructions: Mix the flour and sugar in a mug. Add the egg, milk, oil and vanilla mix it altogether. 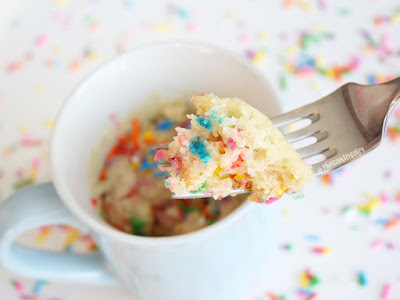 Stir in the sprinkles. Microwave on high for 1 min. 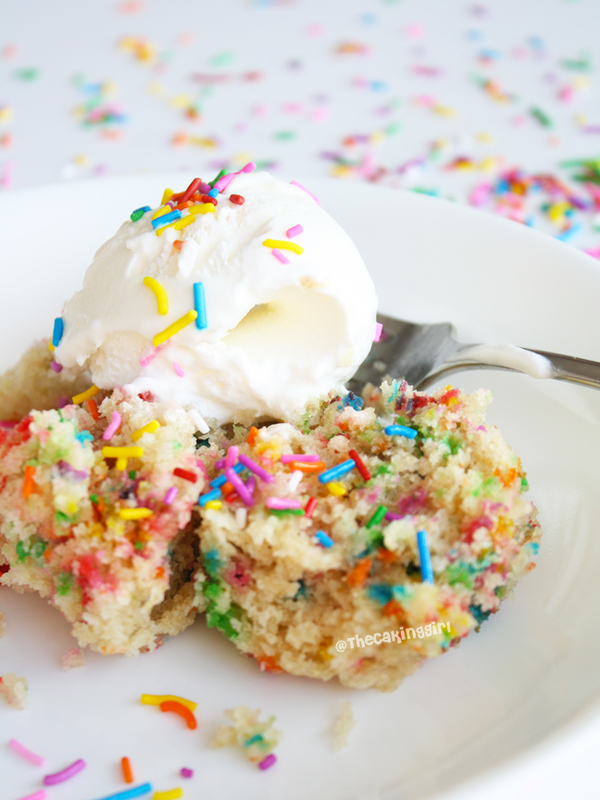 Of course, adding a scoop of ice cream on top of your warm mug cake is the best! Instructions: Mix the flour and sugar in a mug. Then add the egg, peanut butter, milk and oil and stir. Microwave on high for 1 1/2 min. Add marshmellow fluff on top of cake afterwards. Instructions: Mix the dry ingredients in a mug. Then add egg, milk, oil and vanilla and stir until well combined. Swirl in the caramel sauce on top, and sprinkle with sea salt. Microwave on high for 1 min. Instructions: Mix flour and sugar in a mug. Add the coconut milk and vanilla and stir. Stir in the coconut. Microwave on high for 1 min. Instructions: Mix the flour, sugar and cocoa powder into a mug. Then add the wet ingredients and mix well. Shove the graham crackers into the batter and try to distribute them evenly. Add the marshmellows on top. Microwave on high for 1 min. Instructions: Mix the flour, sugar and cinnamon in a mug. Add the applesauce, milk and oil and stir until well combined. Sprinkle cinnamon sugar on top. Microwave for 1 hour on high. Instructions: Mix the flour, sugar, cinnamon, coves, and all spice in a mug. Add the pumpkin, milk, oil and vanilla and stir until the batter is smooth. Microwave on high for 1 min. Instructions: Crush the 2 graham crackers in a ziploc bag. Pour it back into a mug and mix in the other 2 ingredients. Pack it as tight as possible at the bottom of the mug. Add all the cake ingredients in a different mug and stir until the batter is smooth. Pour into the cup with the crust. Microwave on high for 2 1/2 mins. IF YOU ENJOY THIS POST, PIN IT AND SHARE IT! I made the red-velvet mug cake and it overflowed out of the mug. It was still yummy though. Under the apple cinnamon cake, the directions say to microwave for 1 hour. Im guessing this is supposed to be 1 minute..? Please please please don't make the smart mistake I did. Do not and let me make this clear DO NOT put the apple cake in for 1 hour I almost started a fire in my house. Just put it in for 1 min just like everything else. Cocoa powder -- it's not sweetened. I found Ghiradelli for a great price. Disney Frozen cake inspires the children your expertise showed that you have made these cup cakes spending 3 to 4 hours on each. Please share more designs as I am going to start blogging with resume-writing-services.reviews website's help which will assist me in writing content. Hey friends if you are a gamer and want to hack roblox for free online then must try roblox hack its best way to hack roblox for free online.